I’m so excited to be back sharing my favourite recipes with you. It’s been a crazy few months, and whilst I’ve been eating and cooking non-stop I haven’t had the chance to focus back to where it all began, my blog! I’ve written a life update which explains what I’ve been up to recently and what all the yummy food I’ve been making has been fuelling me to do. Move – Move – Move. Now back to the point of this blog post, a new found breakfast obsession, my Tofu Scramble. A Tofu scramble was something I’d seen on endless Vegan menus, but never ordered until recently. I was not opposed to the idea, but didn’t think it sounded nearly as delicious as my regular farmers scramble. After enjoying and devouring the dish I ordered, I had to recreate it at home and share this oh -so-simple recipe with all of you. 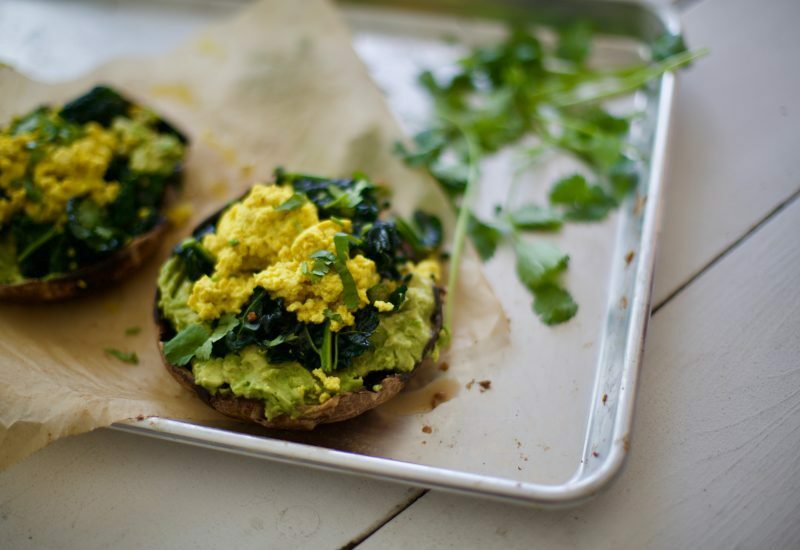 The tofu is spiced with turmeric and garlic, sautéed with tuscan kale, a smooth avocado-lemon mash, all in a meaty portobello mushroom cup. A truly diverse, and delicious breakfast. Place the portobello mushrooms on a roasting tray and drizzle with olive oil. Roast for 25 minutes. Pat tofu dry, wrap in a muslin or small absorbent towel and let any excess liquid drain. Mash the avocado with lemon juice and season with salt, set aside. Mash the tofu with a fork until crumbled into small pieces. Add in the turmeric, garlic powder and a seasoning of salt. Add a dash of olive oil to a pan and add in the tofu, sauté for around 8 minutes until tofu is starting to brown. Add in the kale and parsley, continue to cook until wilted. Remove the portobello mushrooms from the oven. 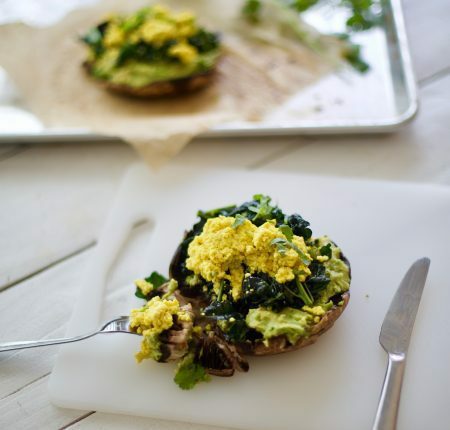 Compile by adding a good dollop of your mashed avocado, and spooning over your Tofu & Kale Scramble.